Domestic cats kill millions of birds and small marsupials every year in Australia. 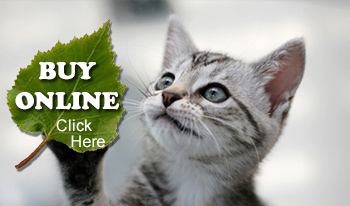 The CatBib helps stop the carnage and restore the natural balance in your back yard, and your local neighborhood. CatBib Really Works. 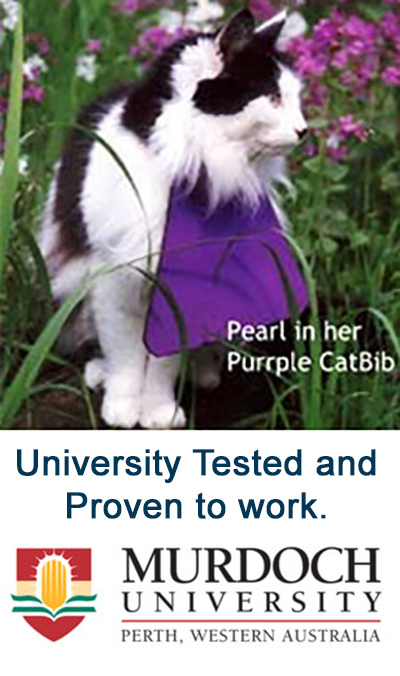 The Murdoch University trial scientifically proved that CatBib stopped over 80% of cats killing wild birds and reduced small animal predation by almost half. CatBibs are simple, easy to use, and cat friendly. Thousands have been sold across Australia and New Zealand. All bibs are sold with a money back guarantee. Regular Bibs from $16.50 plus postage. Big Bibs from $20.35 plus postage. Reflective bibs and collars are also available for an additional cost. Bib the Cat = Save the Birds! CatBibs are safe and comfortable for cats to wear. They fold over the cats safety collar and secure with a strong hook & loop fastening. Made from thin lightweight neoprene CatBibs are soft, stretchy, durable and easy to clean - just wipe off or machine wash. This is the place for Australian and NZ customers. U.S. & Rest of the World Customers, please click HERE. The CatBib acts as a barrier between your cat and its prey. When the cat pounces the bib gets in the way allowing the split second needed for escape. It also serves as a brightly coloured visual warning as the cat creeps up on its victim.